Hello from the Timeline engineering team! With the introduction of our new Chrome extension for Timeline — a top Insider request — we wanted to also share details on how Windows Insiders have helped us evolve Timeline to where it is today. For those new to the feature, Timeline is all about making stuff on your PC easier to find. Unlike most search applications, Timeline not only brings together files, websites and other stuff from across your devices — it organizes everything in chronological order. Can’t remember the name of a website that caught your interest a few days ago? Just scroll down and it’ll be there. Need to quickly get back to a document you were working on earlier today on OneDrive? It’ll be there, too. 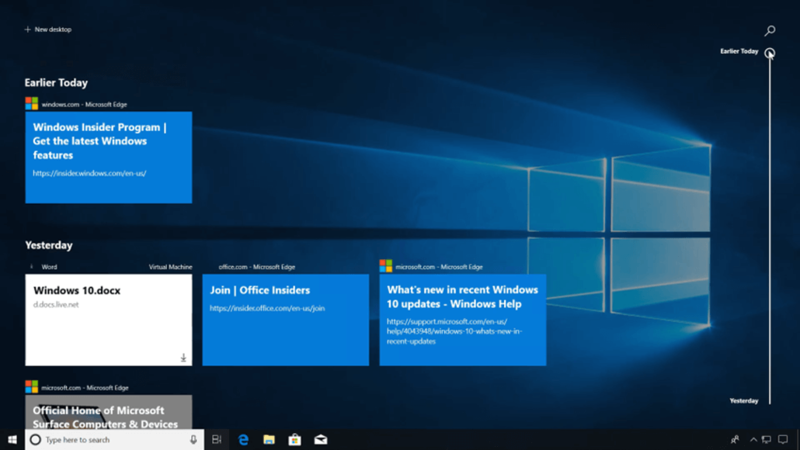 Timeline was officially released with the Windows 10 April 2018 Update. Prior to the public release, we introduced it to Windows Insiders first, starting with Windows 10 Insider Preview Build 17063 in December, 2017. As more and more Insiders tried Timeline, feedback quickly came in across multiple channels, including the Feedback Hub, our automated feedback systems and across social media. One of the early and most popular Insider suggestions was to make it easier to clear all activities from a Timeline. A few builds later (17083, to be precise), we added the option to clear activities by both day and hour directly on Timeline. And that’s when something interesting happened: we saw a 40 percent drop-off in Insider devices using the original Clear Activity History button in Settings. It seemed the more granular control we offered Insiders, the better — a valuable insight that inspired future feature planning. Insiders also liked the cross-device functionality and wanted the option to access Timeline on their mobile devices. One clever Insider went one step further with this suggestion (which also became a top-upvoted idea): why not integrate Timeline with Microsoft Launcher on Android? This was actually an idea we had been noodling for some time. But as with many of our feature ideas, we used Insider feedback to help prioritize the concept in our development schedule. The Microsoft Launcher team announced support for Timeline on the same day that the Windows 10 October 2018 Update was released. Along with suggestions for cool, new features, Insiders have also provided us with valuable performance updates along the way. One example: Insiders reporting a problem where explorer.exe was crashing while they were using Timeline. This prompted us to dig a big further. Sure enough, we discovered that Timeline was crashing explorer.exe if users pressed ALT+F4 while it was visible. We promptly issued a fix in Insider Preview build 18277. Thanks again to our sharp-eyed Insiders for helping Timeline perform as well as it looks! As we move into planning for future development, we are focusing on yet another Insider request: add support for more apps in Timeline. Browser support was especially high on our Insider’s wish list — which led to the recent introduction of our Chrome extension. Now, Timeline can now bring together more of your activities. And with the Search feature (you’ll find it in the upper right corner of your Timeline), you’ve got a powerful tool to filter all of these activities for even greater productivity. Look for more Timeline updates in the future – and keep that feedback coming!